If you happened on this page perchance and are wondering what it’s all about, then I suggest you have a look at these links. 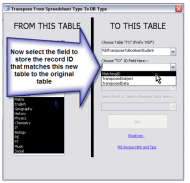 This “Transpose Tool” – “Database Normalization Tool” allows you to easily convert Spreadsheet structured data into MS Access structured data. This transformation of your data allows you to build incredibly powerful MS Access Databases. This transformation is a critical process, only known to and practice by “Power Users”, users with a good grasp of MS Access, usually the “Go To” person in your organisation for MS Access problems. If that’s you, then you probably already know of this technique, and I offer you this tool to smooth and improve the process! I created this video in answer to the question in this thread. Query for years of service — Basically the table resembles an Excel Spreadsheet. 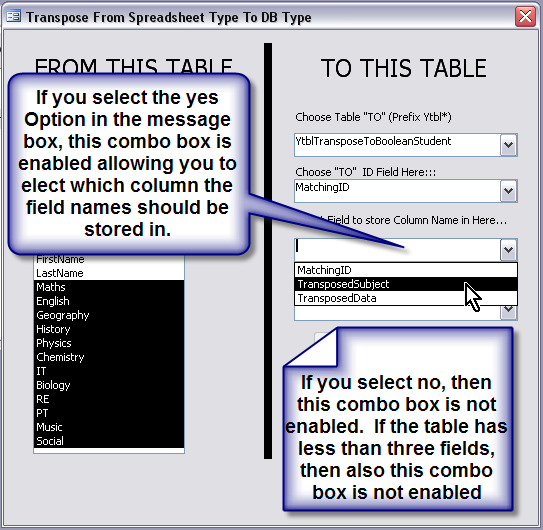 This columnar Data is not ideal for MS Access.The solution is to transpose the Excel like table into a new table, in a format suitable for MS Access. 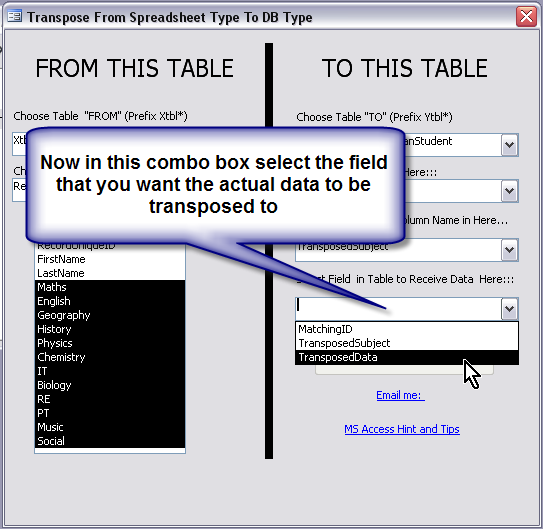 You can download the tool “Transpose Tool – Nifty Access” from “Sellfy” – press the download button below. In this video I demonstrate how to normalise some data imported from Excel. This consists of breaking it up into 3 separate tables. I then demonstrate how this normalised data can be drawn back together again into a useful and usable table. I then demonstrate how to use a cross-tab query to produce a particular output required. The form “frmTranspose” (shown in the video) is available from my website CLICK HERE with further information on issues. 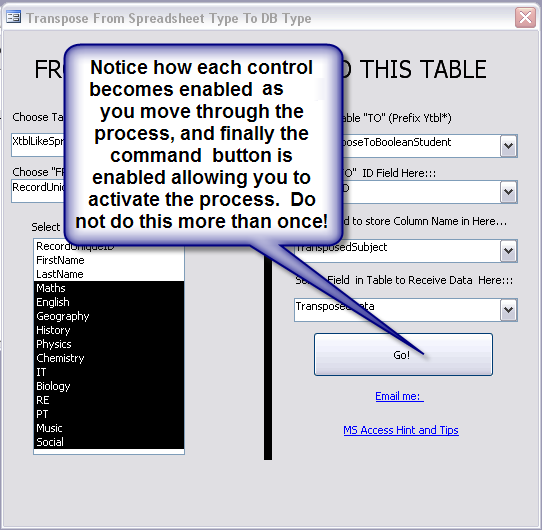 It is very handy for turning denormalized data into normalised data for use in MS Access. A precursor to this video can be found on YouTube here:- Build Query Heads – Nifty Access where I do a presentation showing how to convert the data imported from a spreadsheet into data suitable for MS Access. When you first open the Form all of the controls are disabled, except for the first Combobox. Select the field which represents the “Records” unique identity. 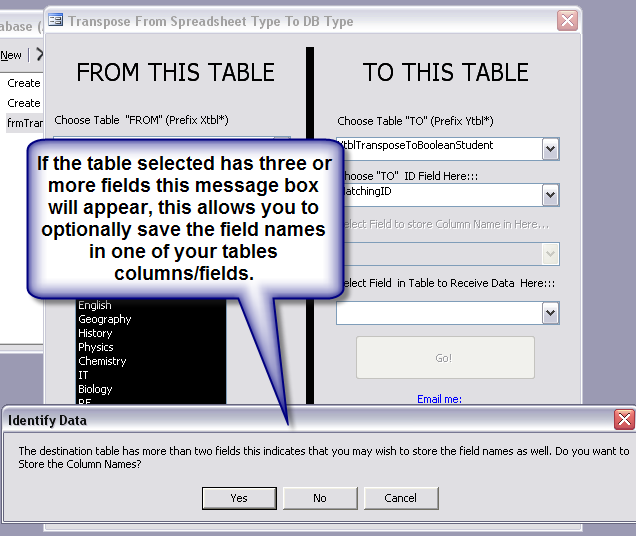 This integer will enable you to link all of your tables back together again, and display the data in the original format. You might be wondering why you have to go through this awkward process, however as you can see in the above video, the benefits in the simplicity of creating your queries, reports and everything else you want to use/do with the data far out way this small Inconvenience, particularly if you catch it early enough in your database development. 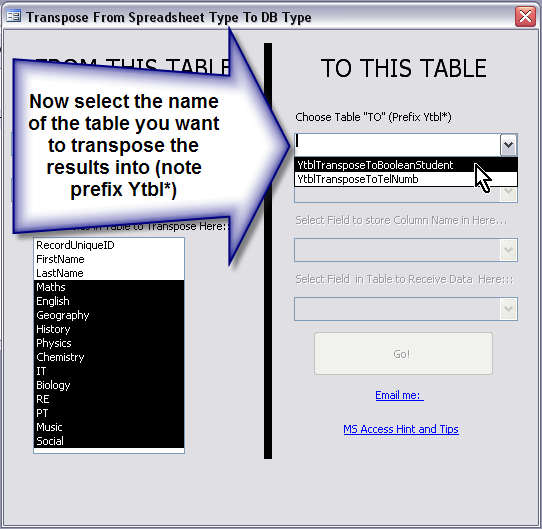 The names of tables prefixed with “Ytbl” will appear in this combobox select the table you want the data to be transposed into from this combobox. Again you are using the three columns solution. So now you need to select the field where you want the data to be placed. In this case, see again the example video above; the Data is whether the person was a volunteer for that particular year or they abstained. All of the necessary selections have been made. You just need to press the button to complete the process of filling the table. Don’t press the button more than once otherwise you will double or triplicate the data placed in it. If you have any problems using this form, of if you have a data set that you think should transpose but you’re not sure how to do it, give me a call…..